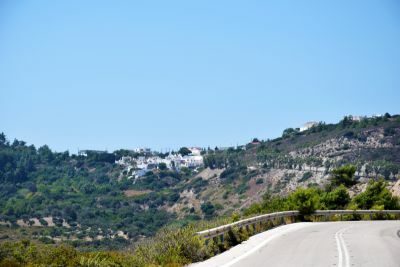 Profilia Profilia, a village situated on the slopes of the mountain Gerakas. 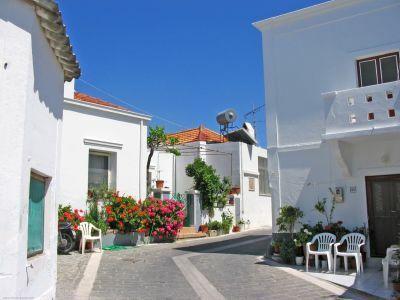 It is another picturesque traditional village of Southern Rhodes with white -washed houses. Sand and tiny pebbles as far as the eye can see. Even on the national Greek holiday of 15th August, when every beach in the country is packed with people, you'll find a place here just for you. It will take you just a few minutes to walk from the village to the beach. Partially sandy and partially pebbly, Kalathos beach is 4 kilometers long. Finding your own private spot should be an easy task, and therefore it is also popular mostly with those who wish to keep a low profile, and also with the local people during the high season. 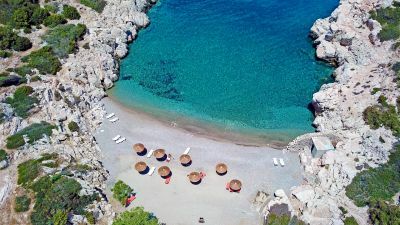 The waters in Kalathos are among the best in Rhodes, and in busier spots you will also find loungers and umbrellas to rent if you would like to. On the street above the beach you will find tavernas, a snack bar and a supermarket. Kalathos is the hospitable face of Greece. Castellas taverna is the place to be for a welcome and update on all the local gossip. Here you can join all the fun of viewing sports with like minded enthusiasts whether it be football, racing or F1 racing. This the centre of the island providing easy access to all the best attractions from Prassonisi at southernmost point to Rhodes Town in the north and Kamiros in the west. From here at is only a few minutes drive to the best beachs, the beautiful hinderland and the world heritage centre of Lindos. Walk round the village away from the main road and see the real Greece. Apart from Castellas there are a number of other bars and restaurants but the one to visit is the Ostria near the beach just north of the big Atrium hotel. Here George feeds you well in his charming garden and sometimes entertains with his magic tricks. Do not miss. Rhodos is a lovely island. Lindos is Great. If you like a cold beer, you have to go to visit the Ikon Bar, not just for the beer though. The venue is great. Have a chilled Mythos in a chilled (properly chilled glass) & enjoy. The owner Tasos runs the best bar in Lindos. Just got back from a great holiday staying in Kiotari. Thanks to Tasos & Anthula for making the visits what they were. I want to go back. Just got back from spending a week out there. Was nice in terms of the place but ended up meeting some very rude people during our time out there, and the hotel was pretty bad. The banisters to the stairs on the outside of the building to the second floor non existant, and you could see the concrete and metal sticking out! Not the safest for my daughter! Was told a couple times that my daughter was not allowed in the bar/resturants with us at first, not entirely sure of the reason. One place changed their mind but one didnt and we went somewhere else. I know you can meet the 'not so nice' people anywhere but it kind of ruined the holiday for us. However, the beaches were lovely! 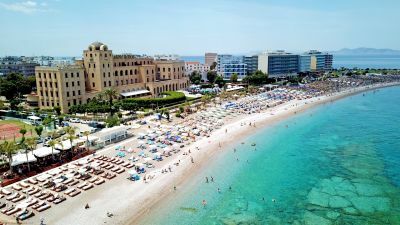 We fell in love with Rhodes and Kalathos in particular on our first visit to the island several years ago and ended up buying a holiday villa there. Kalathos is in a terriffic location midway between Haraki, with its beautiful clean and sandy Agathi beach, quayside bars and tavernas, and Lindos which also has 3 great beaches and fantastic nightlife. Kalathos itself has a magnificent uncrowded beach, several excellent bars and tavernas. You must try Konstantins, just in front of the Atrium Palace hotel and the Ostria - great food and ask George to show you his card tricks. All our friends and family who have stayed at our villa tell us how lucky we are to have such a wonderful home in what must be one of the best locations for exploring the island and the local beaches. We have to thank Trish and Kevin at RPM - Rhodes Property Management for looking after our villa when we are away and providing our guests with such excellent service. It really is appreciated, thank you. Just got back from Atrium Palace Hotel in Kalathos, we were going to have daughters wedding reception at the Hotel until we had a night in the Olive Grove. Jayne and Tommy were just fantastic they made our special day even more special Jayne really put herself out taking my daughter to florist, arranging wedding cake and even glass bottom boats to take us to St Pauls Chapel and back. We were so pleased we changed out minds about the venue everything was perfect. If you are in the area please go for a meal, all home cooked and very friendly. thanks again to a great couple for helping us in everyway they possibly could. What a special place in the world! Rhodes New Town mega for shopping (especially if you are a Zara lover!) Old Rhodes town, something so spiritual and special. But Kalathos, what a fab little village. We were looked after by all the people there, and had the most awesome holiday on record. Konstantina Restaurant was very friendly and chilled, plus you have to try Ikon Bar in Lindos! Great cocktails. Stayed in the Atrium Palace Hotel, which again was so breath taking and beautiful, and the staff looked after us like never before! (Thank you Nick for all our free drinks). We have just come back, and totally fell in love with Kalathos. This has been a holiday I will never ever ever forget. Came back last week, and are going back out for a week in October! What can I say, but Kalathos is my little piece of heaven! PS You must do the lazy day cruise, this is one special excursion, see all the islands beaches and have a BBQ on the beach. So special! I have just returned from the Island games and found The Olive Grove just up from the beach at Kalathos the first night I was there. I ate there every night sampling the Greek menu and it was superb. I would recommend it, and will be going back very soon. Tommy, Jane and Emma are superb hosts and the food is excellent. Loved it there. What can I say! One of the best holidays I have been on in a long time. Lovely unspoilt village with friendly people especially Tommy and Jane at the Olive Grove. Had many a good night there and the best full english breakfast i have had with real sausages and bacon.The meals were lovely and so much choice!If you go you have to try the homemade lemon cheese cake.Jane even gave us the recipe.The beach was not crowded and the water lovely and clear. A really relaxing holiday. Our teenage boys would go off to Lindos for a bit more action but would always wind up back with us drinking one of Tommys cocktails. It is great being so close to Lindos to pop in to do a bit of shopping but you will everything you need in Kalathos itself. We are going back this year and cant wait to see everyone again. Go... you wont be disappointed. Been going to kalathos for years and you can not beat it for a great relaxing holiday. When I go I feel like I am going home. The people are so friendly especially jane and tommy at the Olive Grove just up from the beach. The food is home made really tasty and great value. If you go once you have to go back. Music is excellent and by the end of the night you will be dancing away. Visited Kalathos several times in past four years. Absolutely fab. Great food at the Olive Grove, where Jane and Tommy look after you well. If you want a great night, relaxing atmosphere go to Yiannis. He is a fantastic host. The local supermarket stocks most items and they are very helpful. Lindos is a short taxi ride away where the nightlight shifts up a gear, great for a change of pace. Can't wait to go again. Been going to rhodes for several years now and have made extremely good friends with most of the village of Kalathos to the extent of one family adopting myself and my family as their english relatives! look forward to going back year after year. Pop into Ranchos for a cold one, the owner George is class! I can totally agree. After visiting my father john who has like yourself enjoys kalathos and enjoys many a methos with nikos and thespina! Kalathos is a very clean and frendly village, and the 'bar on the road' is a great place to, but if you like to spend time on the beach this is not the place to go. The beach consisits of all pebbles, difficult to walk on, and if you should venture into the sea you will only need to go out a few meters and it drops away sharply, the bay is so deep that on our last visit there, there was a greek frigget anchored. One end of this beach is also military owned, but dont let this put you off, it is a great base to reach all parts of the island. In one direction Pefki, Gennadi and prassonissi, where the sea comes in from two directions. And at the other end of the island, Tsambika (Tsampika) beach (probably the best beach on the island) with its Monastary overlooking it, Falaraki, if you enjoy night life, and Rhodes Town, with its history and fantastic shopping. An island to remember. We have been going to Rhodes for several years now and liked Kalathos so much we bought a second home there ! It is clean and the locals are very friendly (especially Nikos and Thespina who own the "bar on the road" - that's it's name !) and you are only in spitting distance of Lindos, Pefkos and Lardos. Being one of the most popular Greek beaches among photographers, Elli beach in Rhodes still retains something of its cosmopolitan aspect from the 70's, and is one of the most visited beaches on the island.